Weblate uses privileges system based on Django. The default setup (after you run setupgroups) consists of three groups Guests , Users , Owners and Managers which have privileges as described above. All new users are automatically added to Users group. The Guests groups is used for not logged in users. The Owners groups adds special privileges to users owning a project. Basically Users are meant as regular translators and Managers for developers who need more control over the translation - they can force committing changes to VCS, push changes upstream (if Weblate is configured to do so) or disable translation (eg. when there are some major changes happening upstream). For more fine-grained access control, see Per project access control and Group-based access control. Never remove Weblate predefined groups ( Guests , Users , Owners and Managers ). If you do not want to use these features, just remove all privileges from them. Can force VCS commit in the web interface. Can force VCS pull in the web interface. Can force VCS push in the web interface. Can reset VCS repository to match remote VCS. Can download changes in a CSV format. Can display detailed translation reports. Can start translations in new language. New in version 1.4: This feature is available since Weblate 1.4. You can configure Weblate to automatically add users to groups based on their email. This automatic assignment happens only at time of account creation. 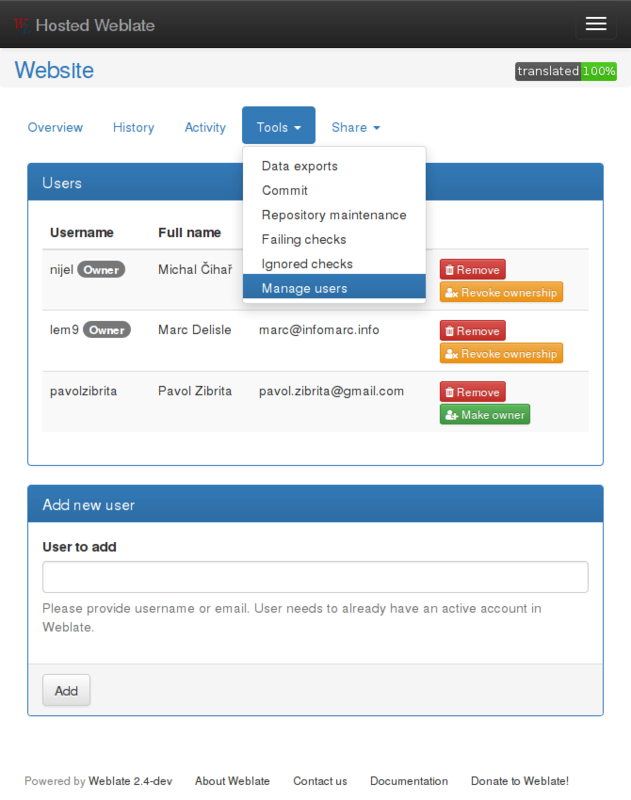 This can be configured in the Django admin interface (in the Accounts section). New in version 2.5: This feature is available since Weblate 2.5. You can designate groups that have exclusive access to a particular language, project or component, or a combination thereof. For example, you can use this feature to designate a language-specific translator team with full privileges for their own language. This works by “locking” the group(s) in question to the object, the effect of which is twofold. Firstly, groups that are locked for some object are the only groups that have any privileges on that object. If a user is not a member of the locked group, they cannot edit the object, even if their privileges or group membership allows them to edit other (unlocked) objects. Secondly, privileges of the locked group don’t apply on objects other than those to which the group is locked. If a user is a member of the locked group which grants them edit privileges, they can only edit the object locked to the group, unless something else grants them a general edit privilege. Create a new group ACL in the Group ACL section. Pick a project, subproject, language, or a combination, which will be locked to this group ACL. Use the + (plus sign) button to the right of Groups field to create a new group. In the pop-up window, fill out the group name and assign permissions. Save the newly created group ACL. In the Users section of the admin interface, assign users to the newly created group. For example, you could create a group called czech_translators, assign it full privileges, and lock it to Czech language. From that point on, all users in this groups would get full privileges for the Czech language in all projects and components, but not for any other languages. Also, users who are not members of the czech_translators group would get no privileges on Czech language in any project. In order to delete a group ACL, make sure that you first delete the group (or remove its privileges), and only then delete the group ACL. Otherwise, there will be a window of time in which the group is “unlocked” and its permissions apply to all objects. In our example, members of czech_translators group would have full privileges for everything that is not locked to other groups. It is possible to lock multiple groups within a single group ACL. One group can also be locked to multiple objects through multiple group ACLs. As long as a group is recorded in at least one group ACL, it’s considered to be “locked”, and its privileges do not apply outside the locks. Group ACLs apply in order of specificity. “Component” is considered most specific, “Language” is least specific. Combinations follow the most specific part of the combination: a group ACL that is locked to a particular component is more specific than a group ACL locked to this component’s project and a particular language. That means that members of the component-specific groups will have privileges on the component, and members of the project-and-language-specific groups will not. The latter will, of course, have privileges on their language in all other components of the project. For project-level actions (such as pushing upstream, setting priority, etc. ), you must create a group ACL locked to only the project. Combinations, such as project plus language, only apply to actions on individual translations. This feature only works for ACL controlled projects, see Per project access control. Users with Can manage ACL rules for a project privilege (see Access control) can also manage users in projects with access control enabled on the project page. You can add or remove users to the project or make them owners.